Corsair has released a range of 192 GB DDR4 kits to complement the workstation-focused Intel Xeon W-3175X processor which features 28 cores. 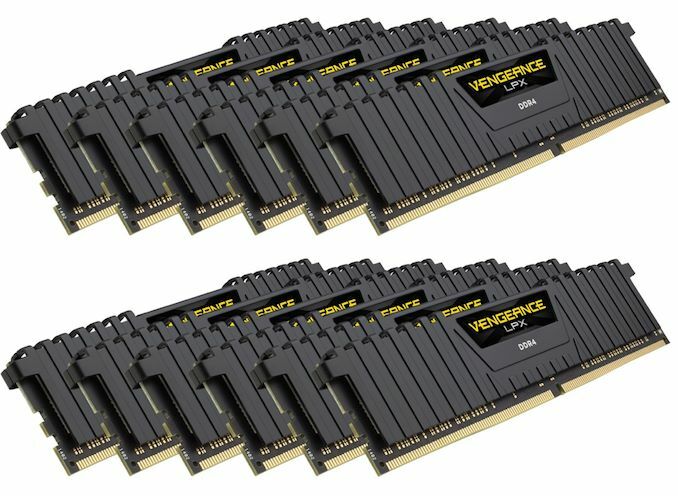 The top kit from the new line-up Corsair Vengeance LPX 192 GB operates at DDR4-4000 with a latency of CL19 and has a price tag of $3000. Using its characteristic heatsink design, Corsair has equipped its 192 GB kits with the Vengeance LPX low profile heat spreaders which are constructed with anodized aluminum and feature an all-black design. Each kit comes supplied with two Vengeance Airflow cooling systems catering for both sides of the ROG Dominus Extreme motherboard; this is the only motherboard that supports the Intel Xeon W-3175X at present. The four kits available are rated at DDR4-2666 CL16, DDR4-3200 CL16, DDR4-3600 CL18, and DDR4-4000 CL19. Each 192 GB kit consists of twelve 16 GB sticks which operate in hexa-channel mode on the Xeon W-3175X and other LGA3647 CPUs that allow for UDIMM operation. On the DDR4-2666 kit, the operating voltage is at 1.20 V, with the faster kits requiring 1.35 V to run at their rated specifications. The four Corsair Vengeance LPX kits are available for purchase directly from the Corsair Store, with each kit occupying a different price point. The cheapest 192 GB kit is the DDR4-2666 CL16 with a cost $1585, while the next fastest, the DDR4-3200 CL has an MSRP of $1720. Moving up to the DDR4-3600 CL18 kit, it costs $2320 and unsurprisingly, the DDR4-4000 CL19 kit is the most expensive with a mouth-watering price tag of $3000. All four kits on Corsair's website are currently listed as 'notify me when in stock', so it will be interesting so see when they will be in stock and how many units will be available. It's not THAT bad, but still could be better. Looking at 2666 MT/s memory, normal Vengeance costs around $90-$110 per stick, which gives around ~$1200-$1300 per kit. Even with two (completely unnecessary) fans, that's over $300 premium over individual kits. Little nuts. "Don't forget that markup is divided between manufacturer, distributor and endpoint retailer." Depends if you are salivating or crying.